I would have just sighed and went back to the garage, then grab a beer lol. But hey, the good news is that you got the crap RNG out of that match all in one fell swoop! Yep! A dog is like "A potato chip! Ya!" while a human goes "Yeah but where's the sour cream 'n onion dip?". 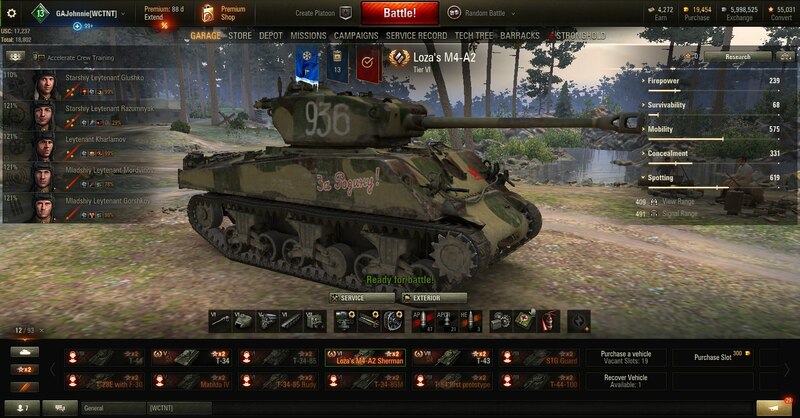 Behold my latest shame...WG how can you be so cruel to exploit my weakness for Russian Mediums! Edited by GAJohnnie, Dec 07 2018 - 14:57. I had a crazy stronghold game last night, I'll try to upload the replay tonight, where the last LT was not spotted for over a minute. I put a shot into a random direction and well... I hit that light who was full on moving.... still dark! Edited by GAJohnnie, Dec 07 2018 - 14:56. Btw the SU-130 is so much fun! The SU-130 is really tempting. I'm trying to focus on Russian Medium and Heavies. I will get back into TDs eventually but right now I am trying to focus my game play and build skill. I bought mine when I had the 50% off. I probably could have gotten to 60% without caring much, but I wanted another prem tank for stronghold battles. So is there an advantage to using Premium tank in Strongholds? Its super easy credits to make since matches run 5-7 minutes, so you get through them a lot faster than pubs. Also when your clan pops a 100% credit boost you can make 120k to 150k profit per battle on wins.... for two hours. So if your tanks needs a daily bonus and your play in SH, you get the bonus on a win? Daily count outside of Pubs? For those of you who did not hear about this. Watching Wot news for the last code. Edited by GAJohnnie, Dec 07 2018 - 20:10. Just don't pop a PR for SHs, only the clan perks work in SHs. You also earn additional XP and credits for SHs above what you earn in the same tanks in Randoms. For this reason, if you were to decide to bring in a tank that has a Premium counterpart, for example the Crommie or T-34 85, then you would be better served to use the Premium Crommie B or T-34 85M in SHs. Edited by the_Deadly_Bulb, Dec 07 2018 - 20:32. It seems you can only use one of the CC codes. Once you do the others become invalid.